We are thrilled to announce that the Episcopal Community Foundation will support the Road Fellows Program in 2018! The $15,000 grant will support the development of an extensive training program for the fellows to equip them for ministry during and after their year of service. This program will create a viable ministry leadership pipeline for future outreach ministries. We are so thankful to the Episcopal Community Foundation for their continued support! You can read the full press release here. Harambee, Swahili for “All pull together,” is the name of the opening session of each day of our Children’s Defense Fund Freedom Schools® program. We asked our Advisory Board Chair, Ward Bondurant, to reflect on his first experience at Harambee. 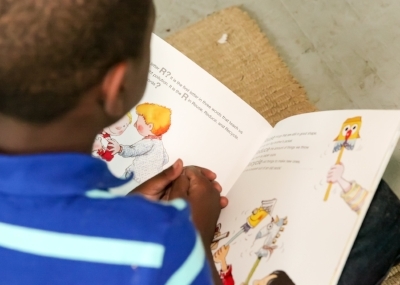 “As I sat in a pew in the back of the Chapel waiting to be introduced as a reader for early morning Harambee during Freedom School, I was scanning through the book that I’d picked out to read aloud that morning. As I flipped the big, color-filled pages to get a sense of the story and how I might want to read it, I noticed that one of the young “Scholars” was slowly moving back, away from the crowd of children at the front of the room, towards me. Coming to my pew, he started looking over my shoulder as I flipped the pages and then smoothly scooted into my row, sliding me over a bit and making a place for himself at the end of the pew. He then took control of the page turning and ultimately started over at the beginning of the book, asking me to help him read it. Smiling, I started from the beginning, and we read together quietly while the rest of the room occasionally erupted in the spasmodic chaos that is Harambee. Harambee is critical to the success of our Freedom Schools® program. It is an opportunity to harness the energy and excitement of our students before powering through our reading-intensive program each day. The students express their love for learning, each other, and their community through song, dance, and reflection. It is also just plain fun! This summer, we are excited to launch “Harambee for Emmaus House,” a campaign to support student achievement at our Freedom Schools program. Next month, you will learn more about how you can help stop summer learning loss. You can even sign up to join us for Harambee on a Wednesday morning in July. Stay tuned for more details. I began working with youth and young adults 18 years ago, and I am blessed to continue this work at Emmaus House. 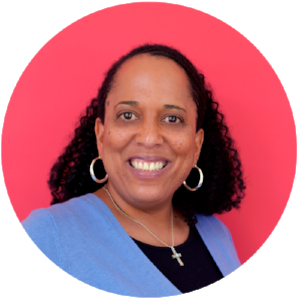 As Director of Leadership Development, I primarily work with two programs: Youth on the Move and The Road Episcopal Service Corps. Both programs foster the development of leadership skills and qualities. Youth on the Move is an out-of-school time program that serves middle and high school students in Peoplestown. It is amazing to see the growth of our young people as they set goals and dream of their futures. The Road Episcopal Service Corps is a leadership development program for college students and recent graduates. Road fellows work in nonprofits and church missions in metropolitan Atlanta. They also spend time developing their spirituality and discerning their vocation in life. It is a great joy to guide the Road fellows on their spiritual journeys and to help equip them for lives of service. I believe that our youth and young adults are our present and our future. I am thankful that Emmaus House continues to focus on the growth and development of young people. 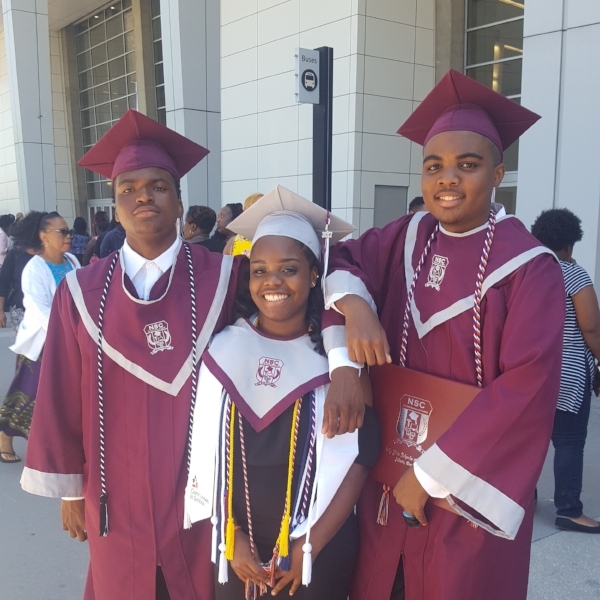 YOTM Senior Spotlight: Alexis (center) pictured with YOTM friends, Quavontaye and Malik, before heading to VSU with $20,000 in scholarships. When Alexis Peterson set foot on the campus of Valdosta State University in mid-August, she had one mission in mind: to let her light shine. Her sister Maxine ‘made a way’ to rent a car that would take Alexis on the 226-mile journey from Atlanta to campus. After a short stop at The Waffle House, Alexis moved into her new home in Langdale Hall. She is one of 1,600 freshmen at VSU. This historically large class size is no match for self-assured Alexis who hopes to help her introverted roommate, Tatiyana, break out of her shell. Fun aside, Alexis credits her commitment to making ‘good friend choices’ and her focus on academics to the support and guidance she received attending Emmaus House programs throughout her middle and high school years. Thanks to your generosity, our capacity to support Alexis, her family and other families in Peoplestown has grown this past year. This year marks 50 years that Emmaus House has served the Peoplestown community. In addition to celebrating this important milestone, we’re looking ‘Forward from Fifty.’ We’re keeping busy each day expanding our social service and education offerings. With the support of the Atlanta Community Food Bank, we’ve doubled the amount of food we can distribute through our Food Pantry. A converted two-bay garage houses our commercial refrigerator and freezer to offer produce, meats, and dairy to our clients. In conjunction with the Peoplestown Family Initiative (PFI), we are moving closer to the goal of removing food insecurity as a barrier to success. Alexis’ favorite program, Youth on the Move (YOTM), is back this fall – bigger and better than ever! We’re grateful that The United Way of Greater Atlanta helps make this possible. ‘Let your light shine’ is just one of the many empowering mantras youth like Alexis learn when they spend their evenings getting critical homework help and exploring exciting career paths at YOTM. When YOU shine your light by donating, you help children and youth to succeed at school and you help parents move toward greater economic well-being. An anonymous donor has pledged to match, dollar for dollar, the funds we raise as you shine your light on Emmaus House - up to $17,000. The impact of every dollar you give will be DOUBLED. With your help, we can look ‘Forward from Fifty’ by serving, supporting, and listening to our neighbors here on the southside of Atlanta. Thank you for partnering with us to make a difference in the lives of children, youth, and families in Peoplestown and surrounding neighborhoods. Alexis’ success story is just one of many we are grateful to experience each day- reminding us of how far we have come and inspiring us to continue the work God calls us to do. Only through your unwavering faith and support are these successes possible. Mindfulness, as a means of stress reduction, has been around for many years. Recently, mindfulness practices have entered the mainstream, providing opportunities for implementation in a variety of settings. One of the goals of our A Great Start for Parents and Children is to provide tools to parents for managing stress in their daily lives. However, through surveys with recent participants we realized that we were not adequately addressing this key goal through our existing program. In response, Emmaus House has formed a partnership with GEEARS: Georgia Early Education Alliance for Ready Students and Georgia State University’s School of Public Health to develop and integrate mindfulness-related skills and concepts into our existing parenting education program. Funding for this effort will come from a grant provided by Bright from the Start: Georgia Department of Early Care and Learning. Dr. Andy Roach at the Georgia State School of Public Health has experience using mindfulness-based interventions in many settings, including with first-year teachers to help manage stress as they learned to work with and support young learners. Based on previous research on the application of mindfulness in parenting interventions, Dr. Roach and Emmaus House are developing and implementing a modified-version of Mindfulness Without Borders’ Mindfulness Ambassador Council Interactive (MAC Interactive) program. The MAC Interactive program offers participants a forum to meet face-to-face and learn about constructive ways for addressing personal, social and community challenges. Essentially, the program establishes a common language based on sharing, modeling and practicing principles that provide members with tools to strengthen their well-being, think critically and act with thoughtfulness and compassion. At the heart of the MAC Interactive program are basic mindfulness practices that help individuals access the wisdom within themselves and within the group. Participants are encouraged to speak from the heart, ask questions to discover their fullest potential, and explore possibilities that lead to a culture of mutual respect, collaboration and ethical concern for each other and the world. This program’s selection was due, in part, to MWB’s success in developing and implementing mindfulness curriculum in diverse contexts and cultures. Our intervention will be unique in that the MAC interactive program will be adapted for use with parents and to be more culturally appropriate for the community Emmaus House serves. GEEARS is working with the Center on the Developing Child at Harvard University to drive innovation in the field of early childhood through strategies that build caregiver capacity to promote healthy development and protect children from toxic stress. The partnership between Emmaus House and Georgia State University on the effectiveness of offering mindfulness-related skills in the ways we currently engage families will launch GEEARs’ network of Harvard’s Frontiers of Innovation projects in Georgia. It’s been a year full of exciting changes at Emmaus House, with the transition to a new Executive Director and the introduction of a new leadership structure. In 2014, in light of the increased demands of leading and growing the programs of EmmausHouse, the Bishop and the Advisory Board made the decision to separate the roles of Executive Director and Vicar of Emmaus House Chapel. Following the retirement of the Reverend E. Claiborne Jones and the hiring of a new Executive Director forEmmaus House, the Bishop turned his attention to the search for and selection of a permanent Vicar of EmmausHouse Chapel. A search committee comprised of Emmaus House leadership and Chapel members, chaired by Rev. George Maxwell, spent six months clarifying the role of the Vicar and interviewing potential candidates. The process was instrumental in discerning the needs of the worshipping community and the qualities of the priest who would be called to this vital ministry in Peoplestown. What emerged was the need for a vicar whose skills would include the ability to expand the chapel’s outreach to children and youth in the community, renew the liturgical life of the chapel, and create opportunities for Christian formation. On June 1, Bishop Rob Wright announced the appointment of The Reverend Ricardo Bailey as Vicar of Emmaus House Chapel. Father Bailey brings a rich background of experience in parish ministry, education, and formation and will work in partnership with Joseph Mole, Executive Director of Emmaus House, to flesh out a robust ministry to neighbors of all ages in the Peoplestown community. Father Ricardo Bailey was born and raised in Atlanta, Georgia. He holds a BA degree in Sociology from Xavier University of Louisiana in New Orleans, as well as a Baccalaureate degree in Sacred Theology (S.T.B.) and a Masters of Divinity (M.Div) from Saint Mary’s Seminary in Baltimore, Maryland. Fr. Bailey was ordained to the Diaconate in 2001 and to the Priesthood in 2003. Currently, Father Bailey teaches New Testament Biblical Studies at The Westminster Schools in Atlanta, a role he will retain in addition to serving as Vicar of EmmausHouse Chapel. He will step away from his current roles as Priest Associate and Priest-in-Charge of Hispanic Ministry at the Cathedral of St. Philip prior to his transition to Emmaus House Chapel on June 8, 2015. Father Bailey is married to Mrs. Marica Bailey and is the father of Alexus, Makiya, Zahria, and Ricari. Along with significant parish experience, Fr. Bailey brings to this work a unique background and gifts in working with young people and an enthusiasm to use those gifts both within the chapel and in the neighborhood with a special focus on children and youth living in poverty. Fr. Bailey is a priest of great faithfulness and energy, and has the full support of Bishop Rob Wright and Joseph Mole as Emmaus HouseChapel begins a new chapter of dynamic ministry in Peoplestown. If you’d like to send Fr. Bailey a note of welcome, you may reach him via e-mail at ricardobailey@emmaushouse.org. “Black boys’ lives have value.” These were the words hand-written on signs photographed by Rolling Stone magazine in the wake of Trayvon Martin’s death in February 2012. On Saturday, these same words filled my heart and mind at the news of Michael Brown’s death in Ferguson, Missouri. Trayvon Marton. Michael Brown. These two names made the news. But prior to the recent media fervor how many black and brown boys have died a similar death in silence, their stories never told? Their violent passing never protested or publicly mourned? While we don’t know what happened on Saturday afternoon in Missouri, both police and eyewitnesses report that this 18-year old, college-bound young man was unarmed. It would appear that fear of the looming figure of a black man was cause enough to fire upon “more than just a couple times,” in the words of the police chief. It happened in Ferguson, but it could just as easily have been Peoplestown. As I walked back to the office after a community meeting late Monday night past a handful of young men talking outside the youth center, I imagined myself for a moment in their shoes. What might it feel like to walk down the street amidst reports that a security officer kills a black man every 28 hours in our country? What might it feel like to live in the awareness that those sworn to serve and protect may perceive me as a threat to protect the community from? I am moved by the words of Oscar Romero, bishop of the Catholic Church in El Salvador, who was assassinated while offering mass in 1980 for denouncing government violence and the violation of human rights. as the human person, above all, the person of the poor and oppressed. he takes as done to him. They touch the very heart of God. May our hearts be moved to love, and our feet be moved to action on behalf of young black and brown men living at the very doorstep of Emmaus House, throughout our city, and across our nation. If you asked me today whether I have more clarity about what I believe—theologically, morally, politically—after this year, I wouldn’t have neat, settled thoughts to share with you. Initially, I would be tempted to tell you that the waters of my mind have been troubled rather than clarified through the many experiences of my year. Initially. A couple Sundays ago, as we celebrated Pentecost, I felt something true wash over me while singing the offertory hymn with our small choir. In the midst of devastating headlines, daunting transitions at work, family dinners, prison visits, MARTA rides, food deserts, and long-distance phone calls, this moment of harmony and yearning found me and held me fast. Right there, with those kindred folks in the back of that little chapel. Like a draught of water when your mouth is utterly parched and unfamiliar. Lifting our voices in this hope, in desperation or trust, reminded me where I was. Right there, with those kindred folks in the back of that little chapel. Standing on solid ground, not sinking sand, and together. For me, there have been a smattering of moments this year when my encounter with another has moved me so profoundly; moments of seeing more clearly or for the first time, a part of another’s journey and understanding a new piece of my own. When I think about my learning and growth over the last year, I’m thinking about recognition of fear, and confrontation with integral Addie-weaknesses and hopes. Courage to face these coming from a life more anchored in prayer, bolstered by times of silence and reflection, but most importantly from the invitation to be with another in a moment of her or his life—in the midst of her or his own troubled waters. Peering through plexi-glass at a detainee in Stewart Detention Center and feeling how thin the barriers that differentiate us really are; playing with the little ones from the chapel and being welcomed into yet another realm of fears and dreams. If I yearn to live in hope and courage and light in any of these moments, it’s because my life is built on that song’s simple prayer, I think. In working to grow my patience and care for others, I have to do the same work within myself. And singing that hymn with my friends and fellow saints was a reminder that we walk the road together, God burning in our hearts, stirring us on. And that strengthens me too. In my first week as Executive Director of Emmaus House I’ve had a front row seat to witness staff, volunteers and community residents “going about doing good” with compassion and excellence. From the smiles on the faces of Seventh Heaven day campers to the warm welcome from community members and numerous meetings with stakeholders, I’ve been both inspired and humbled by what I have experienced. I look forward to connecting with each of you in the coming months as I acclimate to my new role, and I welcome your insight during that process. Emmaus House has a great heritage of ministry, advocacy, and service, and I am thrilled to be part of the good we will do together as we enter this new chapter.